This was one of the few photos I was able to get of Snuggles. 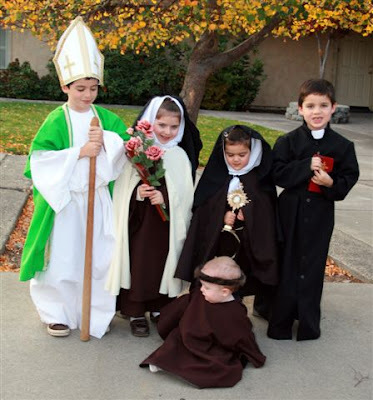 He was dressed as St. Anthony. (Even more children arrived after this photo was taken. now where did you get the monstrance for st. clare? Darling. they are all so incredibly darling! My boys let St. Clare borrow their monstrance for the evening. The boys each have Mass kits from Our Fathers House --one we purchased as Rascal's Christmas gift one year, and we were surprised with another kit that very same Christmas from some friends, so they each have their own! -- and the monstrance is an add on to that kit which I picked up (at a discount) when I was in Washington last May for the homeschool conference. They *LOVE* it!!! Oh, they look so beautiful!! We had our party tonight, I will have to post on my private blog! I don't think I got a picture of all the kids together in the whole group...I think I was trying to get my son to run to get in the picture (he was helping daddy) and then I missed my chance for a shot of the whole group!! It was a fun and crazy weekend though! Your Saints costumes look beautiful! so much fun... AND your kid's costumes were GREAT!!! It was so much fun! And your kids were adorable! How sweet! Of course I love the Little Flower costume! ;) What a wonderful time you all had. 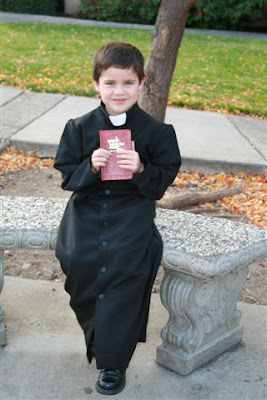 I am interested in knowing more about the patron saint for altar boys. I will have to Google his name! Thanks for sharing! I love their costumes! Really, really adorable! An early visit from St. Nick?!? "Now is the time for Saints!"